The Panasonic Lumix DMC-GF3 is an even more obvious attempt to woo compact camera owners looking to upgrade to the new breed of DSLR-like models than the GF2 was, who will be attracted by the tiny body design, cutting-edge touchscreen and pared-down user interface. Original GF1 owners, on the other hand, will find even less to like than with the GF2, so much so that Panasonic themselves have hinted at a future GF-series camera designed specifically for enthusiasts - those users should consider the new DMC-G3 instead. On the other hand, the diminutive size, speedier auto-focus, new GUI and feature-set and arguably more attractive design may outweigh the main negatives of losing the flash hot shoe, accessory port, stereo microphones and dedicated ISO button for some users. The drive towards smaller and smaller bodies and lenses in the fledgling Compact System Camera market is similar to the megapixel wars that have dominated compact digicams until very recently. The Panasonic GF3 is now as small as the Sony NEX system if you compare the bodies side-by side, and when you factor in the fact that the GF3 has a clever built-in flash and smaller lenses, it's easy to see the appeal of going with the smaller Four Thirds sensor if you can live with the slightly inferior image quality at higher ISO speeds. Our only criticism of this drive to reduce the body size is the subsequent imbalance when using the GF3 with longer lenses, something that is further compounded by the lack of any optical viewfinder thanks to the removal of the external hotshoe. Using telephoto lenses like the 45-200mm is a tricky affair when holding the GF3 at arm's length, and even the 14-42mm kit lens is less than ideal when fully zoomed. Conversely, the GF3 is a real street shooter's delight when paired with the 14mm or 20mm prime lenses, looking to all intents and purposes like an unthreatening compact, aided greatly by the even faster auto-focus system. Those lenses won't be the first choice for compact camera users looking to upgrade, though, so you really need to consider exactly how you will use the GF3 before purchasing. In terms of still image quality the GF3 offers virtually indistinguishable performance to its predecessor. Noise levels are very similar, with a usable range of ISO 160-800 and good results even at 1600, although the fastest settings of 3200 and particularly the 6400 setting aren't really worth using, so the GF3 still can't quite rival a decent DSLR or CSC camera with an APS-C sized sensor in low-light. Colours are accurate when using the default Standard setting, with lots of scope to adjust the JPEG output to suit your own tastes, and the auto white balance is spot-on in most lighting conditions. The diminutive pop-up flash is OK for use as fill-in, the ability to make bulb exposures up to 4 minutes long will please night photographers, and anti-shake via compatible lenses helps to keep things sharp in low-light. 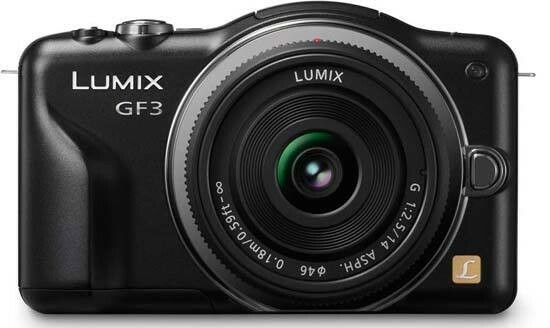 Slightly cheaper than the GF2, the new DMC-GF3 continues to take Panasonic's GF-series compact system cameras in a beginner-friendly direction, aiming to appeal to a much wider base of users who are looking for DSLR-like results from an even simpler and more compact design. We do have a few more concerns about the GF3 than the GF2 though, most notably the lack of an external viewfinder, flash hotshoe, stereo sound and fewer external controls, but the majority of the GF3's target audience will probably never notice their absence, while the speedy auto-focus may tempt more advanced users looking for a small and inconspicuous system.